Jacob’s Creek, I’ve always thought, is to wine what Ladybird is to books, Metro is to newspapers and Justin Bieber is to music: it’s a decent place to start, I suppose, but a terrible place to end up. I wonder how many dedicated wine-lovers of the 25-45 age bracket got through a decent amount of JC, back at the beginning. I’m certainly guilty as charged, and I think I’m one of many. Many millions, perhaps – someone’s got to be getting through the stuff, after all. But all JC ever did for me, back when I actually drank it, was give the strong impression that there was something better, much better, out there for me. Its initial appeal was that this was a much improved method of getting drunk than the standard student mainstays of cheap vodka (too imprecise – in the time between me drinking enough to get me drunk and it actually making me feel drunk I would always drink some more, and end up feeling very sick indeed) and beer (too fizzy, too many trips to the toilet). Even then, though, wine represented a way of making the process of reaching the destination just as enjoyable as the destination itself. Now there is (almost always) no destination at all; it’s all about the process. And that makes the process really important. Too important to waste it on Jacob’s Creek Chardonnay, to be sure. Presumably there are people who try one of the basic wines in Jacob’s Creek’s range, like it, and then never drink anything else. Just as there are people who spend their lives drinking Carling. I do not understand those people. Do they not look at other wine bottles, all those other bottles, and wonder if their contents might be better? Or at least more interesting? But Jacob’s Creek is changing. It is becoming more unpopular, for a start – now the sixth biggest-selling wine brand in the UK, overtaken last year by First Cape and Echo Falls, with an 18% fall in sales nationally and a 10% drop worldwide (they now shift just the 7.1 million cases a year). And it is going posh. In new markets they are deliberately avoiding the cheap plonk pound – the idea of ordering JC in a restaurant would seem bizarre to most Brits, but I’m told that in China 60% of sales are in restaurants and bars. The recent downturn in sales – not all bad news: the accompanying 10% price increase led to a 1% rise in profits – was described by parent company Pernod Ricard as “reflecting our premiumisation strategy for the brand”. Here, while they promise “no major changes to the classic range”, they have rebranded and relaunched a range of Regional Reserves, adding geography to grape variety to “target the more evolved wine consumer”. They’re very much on-trend there, with regionality also a key message of the recently-launched A+ Australian Wine campaign. And the really good news is that the wines are a big step up from the standard offerings too, with only the pinot noir a genuine disappointment (Not undrinkable, but I found it didn’t taste much like a pinot, but it did taste a bit like dirt) and a couple – particularly the Barossa Riesling (the Barossa might not be particularly well-known for its riesling, but 80% of the fruit comes from the Eden Valley, only just below the threshold for putting that region on the label instead) and the Coonawarra Cabernet Sauvignon, were pretty impressive. RRP for all the wines in the range is £9.99, but if you’re lucky or patient you may be able to find them at a couple of pounds less – only fractionally more than the standard range, but of considerably better quality. 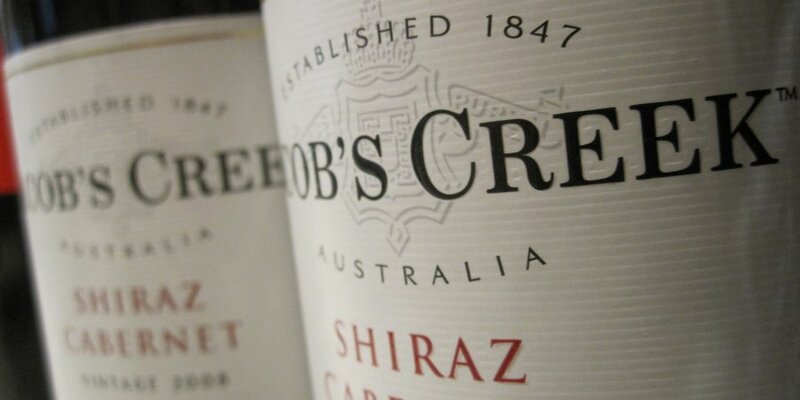 Because of its place in my own wine history Jacob’s Creek, alone among the big brands, retains a place in my affections, and I suspect that many others feel the same. I don’t know whether he is aware of that, but what with the giant marketing spend that sees its logo plastered around the courts at the Australian Open and Wimbledon, plus the need to produce a little (well, 200,000) over 85 million bottles of wine every year to fill those 7.1 million cases, their winemaker-in-chief, Bernard Hickin, is under enough pressure already. Not that he showed any signs of stress as he picked the remains of his second steak of the day from between his teeth after dinner a couple of months back. And they have, producing a nailed-on, typical, reliable if not exactly thrilling £10 banker. And if anyone genuinely doubts JC’s ability to produce decent wine, a drop of their 2001 Johann shiraz-cabernet, the star of an impressive premium range that frankly I never knew existed – £31 is the cheapest I can find it at – should put them right. They’re doing a lot right, in short. But they’re still Jacob’s Creek, relic of my student days, as much a part of my past as nightclubs and 50p-a-pint drinks promotions. If I let that logo back into my house, it’s only a matter of time before I’ve got a Magic Eye poster on my wall and a 1,000 word essay about the Comedia dell’Arte to write. And that lazy prejudice is why, while Jacob’s Creek will always be close to my heart, it might well be stuck some way from my wine rack. This entry was posted in Uncategorized and tagged A+ wine, australian wine, jacob's creek, students. Bookmark the permalink. Australia as a whole is clearly going through an identity crisis with too much over-produced alcoholic ribena and grape juice on the market. Many people are absolutely fine with this, but for more discerning palates their first impression of Australian wine can be a negative one. It can only be a good thing that a company with the marketing muscle and reach of Jacob’s Creek are upping their quality game.